This weekend is my most difficult weekend of the year. A huge physical effort is required to set up our venue for the Puzzler and mentally I just get wiped out. Not being able to race is tough, but it’s worth every bit of effort. 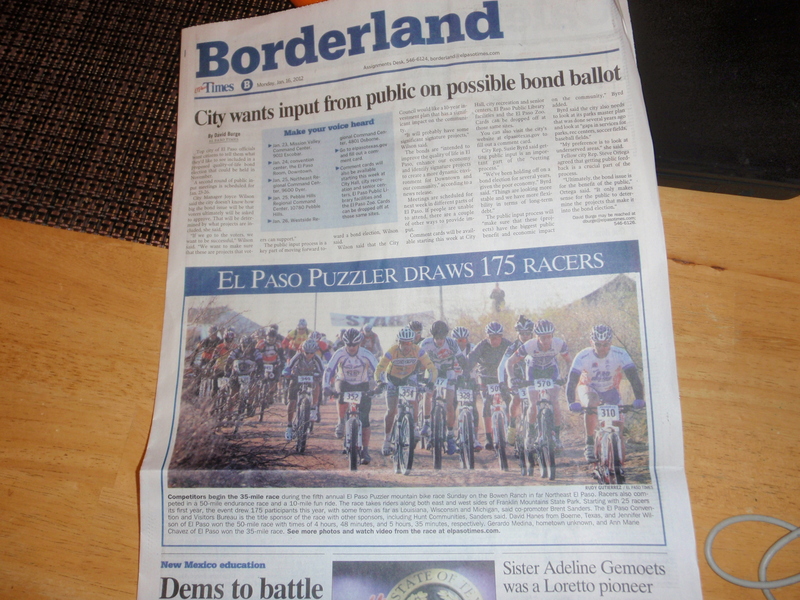 I truly believe the Puzzler is one of the best run mtb events in the country. It may not have lots of spectator fencing and course marshal on every corner, but the trails are well marked, our volunteers put their efforts where it counts, and we have a great value for the dollar. I think we’re right up there with Laramie Enduro, but we charge a hell of a lot less. 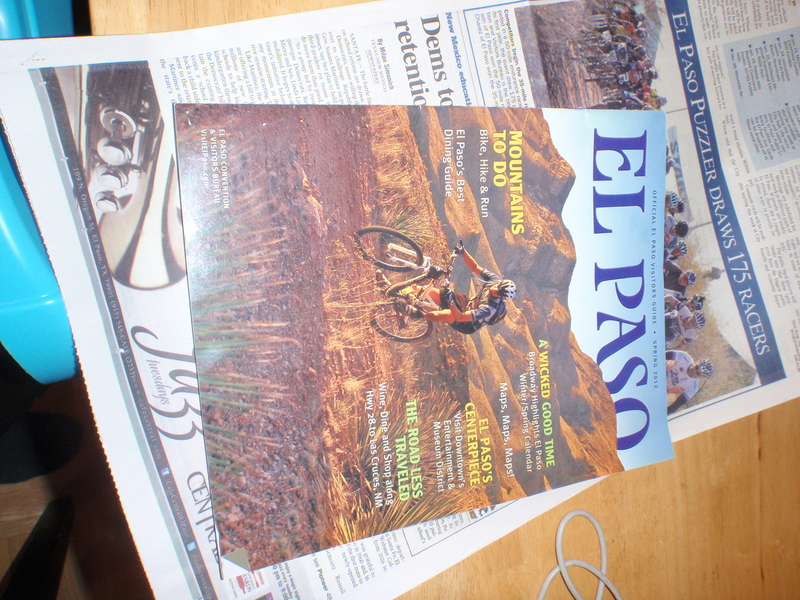 We got some great coverage this year in our paper. Here’s the online version. This year’s Puzzler came together really late in regards to sponsorship. 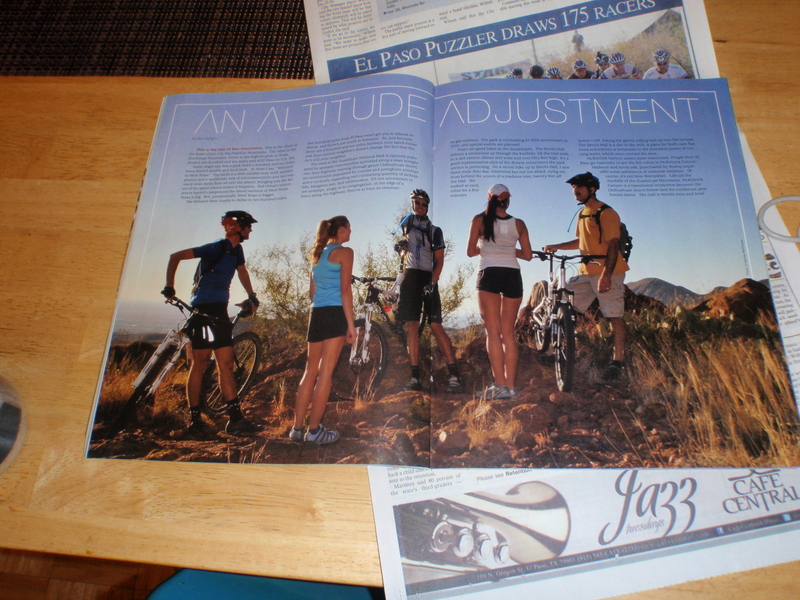 The El Paso Convention and Visitor’s Bureau picked us up just before Christmas. This has brought about a bit more PR than we normally get. It will be interesting to see how it affects turn out. We’ve got some great new trail that we finally buffed out on Sunday. We were a bit concerned about that as well. Stan’s and WTB are back on with us….they hoped back on at the last minute as well….last week. I spent 2 days in a row signing the east side of the mountain. Signage is stellar! Daniel Horsch from the CVB joined me for the first couple hours of marking course. He took some video. Not all of it is totally accurate. He says riders from as far away as Utah are coming. Nobody from Utah has signed up yet, but we’ve got 2 from Wisconsin and 6 from Louisiana who are registered I think WI is a bit further of a drive than Utah….though I haven’t mapped it. He also states something about riders taking home $400. The men’s and women’s 50 mile winners will take home $400 plus some prizes. Our payout is pretty good. Our trails are awesome! Our sponsors are on board. Our cooks are making huge batches of chili. Now it’s the weather that has me nervous. This is the first year we’ve even bothered to come up with a back up plan for the weather. I’m keeping my fingers crossed. If we get nothing but a bit of rain and snow, we’ll roll on. A lot of rain and snow and we may still roll but offer a bailout plan for those who don’t want to start. If the winds are exceptionally high and the snow starts to accumulate, then we may make some course adjustments. We’ll see. May the stars align for us! 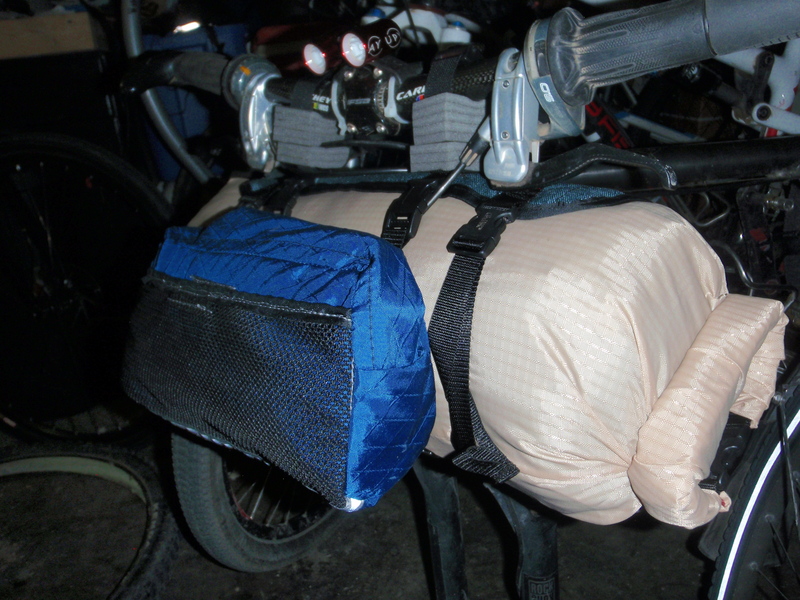 I finally got my bar harness mounted up with a new stuff sack and pouch. Some small adjustments and I’ve got a much better fit. 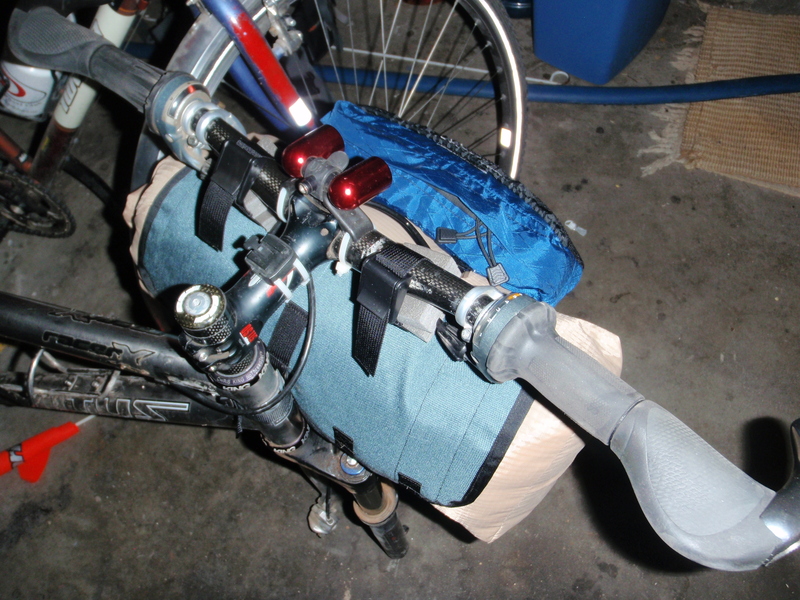 I feel it’s better to go with a slightly fatter and narrower stuff sack in order to reduce the moment of inertia. With a longer bag you could really feel the steering’s slowness. I’m still not completely happy with the pouch, but I’m getting better at sewing up these smaller items and figuring out how size the inner pockets and get everything to fit correctly. I’m not the biggest fan of the color of the stuff sack, but it’s double ripstop mil-surplus stuff that’s coated and pretty light. 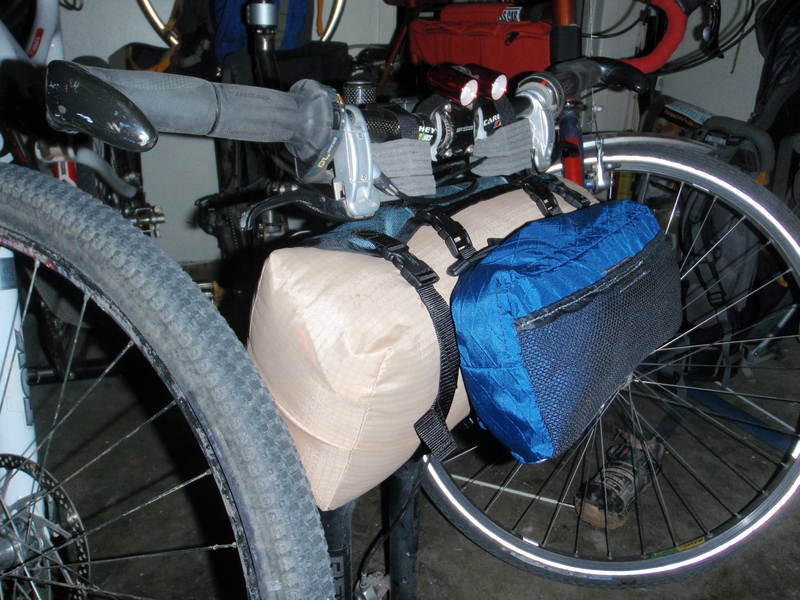 As my fifth or sixth stuff sack I think I finally have the method….especially for the roll top.